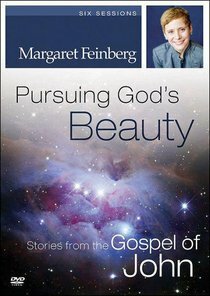 In this six-session small group Bible study DVD, Pursuing God's Beauty, Margaret Feinberg looks at six stories of beauty from the Gospel of John that illustrate how God's beauty is present in our lives. God created us to be drawn toward beauty?created us to pursue beauty so that we might know more about His character, attributes, and work in our world. Perhaps no book of the Bible paints a clearer picture of this than the Gospel of John. Throughout John's Gospel, the beauty of God radiates in the person of Jesus Christ?the one in whom God displayed His whole heart for the world to see. It's within the person of Jesus that we find the invisible attributes of God being made visible, on display like fine pieces of artwork?to be enjoyed, celebrated, and reflected on. This DVD features six 10-15 minutes sessions of live teaching by Margaret Feinberg and is designed for use with the Pursuing God's Beauty Participant Guide (sold separately). About "Pursuing God's Beauty (Dvd)"